Spend the year 2013 with Sato rescues and get inspired by their powerful stories paired up with inspirational quotes. All proceeds will go to The Sato Project. 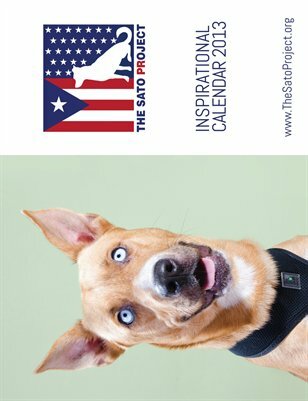 The Sato Project is a 501(c)(3) non-profit dedicated to rescuing abandoned and abused dogs in Puerto Rico. "Satos" is the name given to street dogs in Puerto Rico. There are about 250,000 strays roaming the streets and beaches of Puerto Rico, an American Common Wealth the size of Connecticut. The Sato Project primarily rescues on "Dead Dog Beach", and works on making permanent changes for the dogs of Puerto Rico. To learn more about their work, visit: www.TheSatoProject.org. In 2013, change the lives of Satos while changing yours!